Martina Anandam recounts a learning exchange visit during which she hosted another member of the CLP alumni network. Spoken like a true primate enthusiast! Felipe Ennes Silva and I met in 2012 at the Conservation Leadership Programme’s Conservation Management & Leadership Training Workshop in Canada. We had both been part of separate CLP-funded Team Conservation Awards: Felipe, for a project to protect a small Marca’s marmoset (Mico marcai) in Brazil; and me for our Chamba sacred langur (Semnopithecus ajax) project in the Himalayas. Although our projects are continents apart, our conservation challenges are similar. In Canada and thereafter we thought about how we might be able to help each other first hand. We brainstormed possible solutions and laid the foundations for inter-continental conservation knowledge sharing and learning. Two years later, thanks to a CLP learning exchange grant, we were able to meet again in India, at my very own field site in Chamba Himalaya. Felipe arrived in Chamba straight from the International Primatological Society Conference in Hanoi, Vietnam. Vishal, my team mate was assigned the complicated responsibility of locating and identifying Felipe at the crowded Chamba bus station. After a gruelling 17 hour bus ride from Delhi, Felipe arrived at the field station, surprisingly fresh faced and brimming with excitement and enthusiasm. ‘How did you find him?’ I asked Vishal. ‘The CLP T shirt! It wasn’t that difficult!’ chuckled Vishal. Felipe was both excited and a little worried about our planned field activities. As anyone who has been out on wildlife surveys knows, catching sight of seldom-seen primates can be a thing of luck, as well as good planning and technique. The langurs were near our field station a few days before Felipe’s visit, but now we were out looking for them they were nowhere to be seen. And there he was. A handsome male langur, galloping down the mountains before disappearing again. Chamba sacred langurs are shy of humans and prefer to stay hidden within the dense deodar and pine forests. Deforestation and many unsustainable developmental practices force the langur out of their degraded habitat, into fields and human settlements which often results in conflict. This solitary male was indeed fleeing from a field, being chased by the irritated owners. We spent the next day packing and warming up for Kangra Valley, a small town about 150km from Chamba. Kangra Fort is a tourist hotspot of historical importance as a Mughal stronghold and is also an excellent place to find Chamba sacred langur. We set out early that morning, climbing to an altitude of 2,400m. Through the post monsoon showers the mist was folding and unfolding over the mountains, setting the scene for the unforgettable drive. The outlook soon changed when we descended down the mountain, to the valley at an altitude of 600m. The cool breeze was blasted away by scorching heat and dust. After a quick wash and the ever soothing chai, we set off to see some of the local sites. The Brajeshwari Devi Temple in Kangra is an age old architectural marvel and Felipe experienced a riot of colours, music and culture. The following morning, we visited the fort – built in the early 4th century and the site of many conquests and calamities. We trudged our way through the ancient walls, baking, as we were, under the repressive sun. As we were about to enter the main fort, we saw something stirring within the trees. Langurs! These individuals looked very different from the langurs we were expecting to see and they demanded several hours of our keen observation. Nestled amidst the Dauladhar Ranges of western Himalaya, with peaks ranging from 1,400-4,000m, Dharamshala boasts beautiful high altitude deodar and pine forests, and our langurs of course. 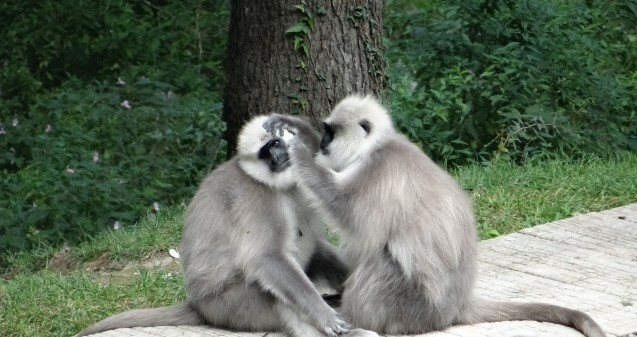 Despite our many attempts to find the langurs in Dharamshala, they proved elusive and we were unsuccessful. But the gentle monsoon showers and the picturesque mountains made the experience worthwhile. Felipe was also able to spin the prayer wheel and meet the lamas which was a unique experience. During Felipe’s visit, we were able to exchange ideas and discuss points from our personal points of view. Together, we were able to lay down our challenges on a singular plan, look at them objectively, dissect and analyze the issues and arrive at solutions. We realized that some of our conservation challenges are almost identical and it was essential to share such cross-country knowledge and experience to arrive at holistic solutions. It was a great ten days with Felipe and, as we said our goodbyes, we wondered when our next meeting might be. Conservation is a tough, demanding and sometimes lonely line of work! But we can all benefit from meeting and learning from like-minded peers. We are not alone in our fight!